If Humans Live Off Planet, Are We Still Earthlings? Today is the 15th anniversary of continuous human presence onboard the International Space Station, which was built in peaceful cooperation with 16 nations. It's our orbiting Peace Prize. Just think: we conduct business outside the atmosphere of this planet in multiple languages, breaking bread with former enemies, and supported by over 100,000 Earthlings from around the world. I started NASA in 1985. I received a call, straight out of grad school, from a NASA executive asking me to come work for NASA to help build Space Station Freedom, which had just been announced by President Reagan the year before. Though I knew nothing about space, I accepted the offer and started working at NASA when Station was still on the drawing boards. 30 years later, we've hit this important milestone in our mission to explore and inhabit the heavens. Cool that I got to take part in the journey. NASA created an awesome commemoration page with everything you'll ever want to know about Station. 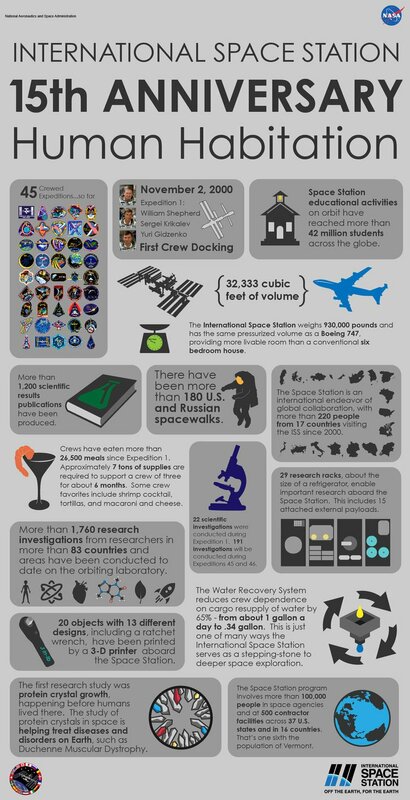 Here's an infographic to give the accomplishment some perspective, with 45 Expedition missions under our belt. You can also watch videos on the benefits of Station, and much, much more. Human spaceflight makes my heart flutter. I love the human experience, in all its messiness. I find it mind-blowing that we assembled a massive orbiting outpost -- module by module, system by system, cable by cable, with human hands and a few cool spacey drills -- ALL in space...AND everything worked. Station is an engineering marvel -- the First Wonder off the World! Celebrate with me as we salute to what the human spirit can do when we put aside our differences and come together for a greater good. Hat tip human race. So the question is, how long do we need to live onboard Station to no longer be Earthlings? Astronaut Scott Kelly will live in space for a year. Does he give up Earth citizenship? If not, how long before we do?